I’m Gina Albertson and I own an aromatherapy shop in Cranberry Cove where my son and step-daughter live. It’s a nice little town with a main street called Beach Hollow Road where there are a number of shops including Bart’s Butcher, Gumdrops, the Cranberry Cove Diner and a place called Twilight run by Tempest Storm. It’s a new age shop and if there’s any place the locals are less likely to visit than an aromatherapy shop, it’s a new age shop. We do okay though thanks to the tourist trade. It’s June and people are beginning to come to town although the temperature of Lake Michigan is still too cold to tempt me into the water. I was rearranging my vials of essential oils when the door opened and Tempest breezed in. She was wearing a dark blue caftan and had a large amulet hanging from a silk cord around her neck. “Look what I’ve brought,” she said as she approached me. She reached into her oversized tote bag and pulled something out. “What’s that?” I said, pointing to the box in her hand. I laughed. I remembered playing with one of those when I was a kid. Betty Sue next door and I used to ask it to tell us who we were going to marry. One time it spelled out the name George and poor Betty Sue burst into tears because the George in our class was short with pimples and glasses. Tempest moved aside some things on the counter and set up the board. “What are we going to ask it?” I said. Tempest rested her fingers on the planchette and closed her eyes. “Is there going to be a romance in Cranberry Cove?” she said in a serious voice. The planchette began to move. I wondered if Tempest was moving it herself to fool me. Slowly the word yes was spelled out. We thought it had stopped moving, but it began to move again and this time pointed to the numeral 2. She put her fingers back on the planchette and closed her eyes again. Once again, it began to move, this time spelling out the word wedding. Tempest gasped. “Looks like there’s going to be a wedding in Cranberry Cove,” she exclaimed. Have you ever played with a Ouija board? What did it tell you? 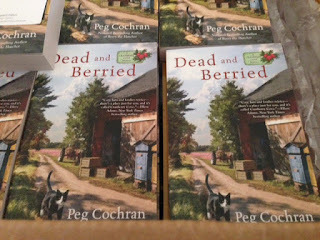 Dead and Berried will release May 2 but I am offering one copy to someone who leaves a comment below! I have read previous Cranberry Cove mysteries and enjoyed them very much. Yes, my friend, Cathy J. and I played with a Ouija board when we were in High School. We asked a lot of questions and we got answers but to the best of my knowledge the information it gave never came true. I've never played with one. I have never played with a Ouija board nor will I ever play with the Ouija board. There are too many things in this world that we don't know about and some can actually be contacted through these methods. I've heard and seen too many weird things to want to deal with trying to contact them. The book sounds fantastic however! I love reading about anything paranormal or characters playing around with it, so this sounds like it would be fun. I absolutely love the first two books to this series! I am beyond that the third book will be out May 2, 2017. I find myself awake at the earliest hours of the morning because I couldn't pull myself away from reading! I am beyond excited to purchase the third book and keeping an eye for hopefully (fingers-crossed) a fourth book in the future to the series! I would love to win a copy of this book! I am always interested in finding a new cozy mystery series to read and this one sounds like it is perfect for me! I have never used a Ouija Board. I am not sure I would want to know what might happen in the future. I own two of your previous titles and would love to add this new one to my collection. I love the series and have been forced to borrow them from the library since my book buying budget was slashed. Sounds like fun! Thanks for having the contest. Sounds like a great read thanks for chance. Never done a Ouija Board before. Would love a chance to win. Thanks for the opportunity! I have never used a Ouija board. My cousin and I tried a Ouija board once late at night and scared ourselves silly! Looking forward to reading this new book! I used to mess around with a ouija board, never will again, too many bad experiences. Would love to win! I've never even seen a ouija board in person. I don't think I'd really try it either. I'd freak myself out no matter what actually happened. Love your books! So entertaining! So far I haven't been able to figure out "who dun it"
Yes I have it's kind of spooky. I really want your new book! I just enjoy that series so much! Thank you very much for the chance to win it. The book sounds great!! I appreciate the chance at a copy!! Thank You! I have in the way long ago, but I have a strong sense of caution about them now. We used to play on the ouija as teens---and it told me I'd have 4 husbands. I'm on number three now---but I think I'm stuck there for good! I've read the second one in the series and also have the first one (and some of your other books). No, I would never play with a Ouija board. I know better than that, plus I've seen lots of true ghost stories where they accidentally released something bad after playing with a spirit board. I've even seen one or two where they got rid of the board and it came back! Better safe than sorry! Yes I have played with a Ouija Board with a Friend while in College. It told us all kinds of strange things. Talked about a past life that we had known each other in and then said a Friend would come by the next day that I had not seen in ages. Weird and spooky...and the friend did come by..thanks for the chance to read this book. I've never played with one. I'm just scared enough to not. This is a new series to me. I like that the story is set in a town close to Lake Michigan. Really enjoyed the description of the book, can't wait to read the series. I haven't read the other books in the series but now I want to. I have heard good things about this book and would love to win it! Love this series. Thanks for a chance to win a copy. Love this series, my Mom used to describe the Cranberry farms in Mass she visited as a child so I love seeing them through your eyes. Fabulous series !!!! Would love to read! Love the cover! I have never even see a Ouija board let alone played with one. I thoroughly enjoy all of your books that you have written so far and I know I will enjoy this one too. I've never used a Ouija board but I've read the first 2 books in this series and loved them! I have played with one but it told me nothing. Really enjoy this series! We messed around with Ouija boards in high school. Thanks for review!!! Ouija boards give me the heebie jeebies and I try to avoid them. Would love to win a copy of this newest title. thank you for the chance. We had an Ouija board when I was young. I don't remember it giving us any messages, but I do remember feeling excited and a little creeped out when we used it. Your book sounds amazing! I'd love to read it. Thank you for a chance to win a copy. Never used a Ouija Board but this series is terrific!